Well I got a few minutes before I had to head off to work so I started work on the next character in SBX2: Floyd, the Mechanic. So far I have his profile image for dialogue and a standing image of him. I think the standing image is all I will use for now, as he is just a minor character and doesn't really need much animation. You will meet him in the Auto Docking Station of Level 1 and talking to him unlocks the Auto Shop to upgrade your ship (Which I will make soon). 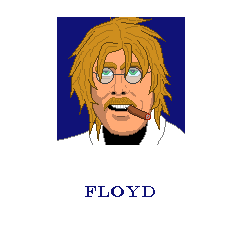 Meet Floyd, the Cigar Smokin' Mop Headed Genius Mechanic that can help upgrade your ship when you get new items and weapons! You might have to save him from some fuscian blobs when you examine the docking station though. No that is not a cow suit, those are oil stains. And he does have the cigar, but it's barely visible. I only had an hour or so to work on the game so this is all I have done, but soon I'll add more. Be sure to check back for new areas in level 1 including an explorable area with fuchian monsters to beat and items to uncover, as well as the Auto Docking Station where the next part of the story continues. And then I'll work on the actual docking station to allow you to upgrade your ship and prepare it for all the cool stuff you can unlock in the game. Also I need to make a bunch of new add-on items as well. But I have some ideas already :). Well, thanks for reading folks and look for Floyd soon in the near future to new updates of SBX2. **also... woot woot 50 downloads!